Jon is spending the evening watching scary movies while his parents have left him alone for the evening. Kathy stops by begging for Jon's help to find Bessie, the prize cow and her grandfather Cobb who have both vanished over two hours ago. Jon and Kathy cycle around the area until they arrive at Deadman's Swamp. Despite their fears they decide to investigate inside in case Cobb is hurt. During their investigation they are disturbed by a shadowy figure who begins pursuing them. Jon spots a house in the woods and the two children race there chased by a hungry owl, then a giant raccoon, a giant tortoise and even a vicious giant porcupine. Jon and Kathy manage to get into the house, with the shadowy figure just seconds behind them. Once inside, the house seems to come to life attacking them at every turn. They happen across Bessie who also grows to colossal proportions and then vomits a wave of liquid that forces them back outside. The two children clamber down into a nearby well and to their surprise Cobb and Bessie appear safe and sound and guide them both back home. Cobb brushes off their story of strange goings on as the swamp gas playing with their imagination. Jon races home and tucks himself in seconds before Lois and Clark return home to check on him. Story - 2: With everything going on in the Super titles we did need a breather issue just to have a little processing time and to ease the shift in momentum. The problem with the story is that there isn't one. Is it Other Clark stalking Jon? Is it Cobb Branden? Why is the cow involved? What significance does the mystery house hold? Does Kathy now Jon is Superboy or not? Each of these questions are raised at several points in the issue but not one of them is answered. I liked the theme. 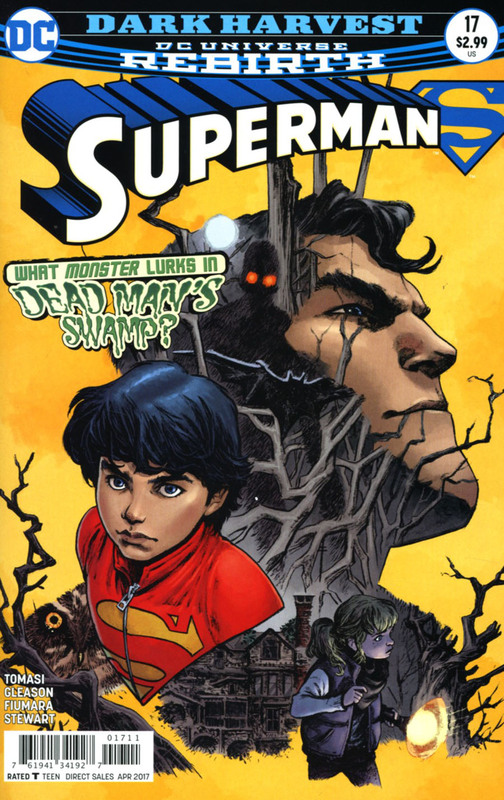 Supernatural stuff that both Superman and Superboy are vulnerable to but even that isn't explored. I'd like to think that the shadowy figure is Other Clark so it ties in with the story going on in Action Comics but by the end of the issue I was left thinking... this issue had such potential but it was ultimately forgettable. Still it wasn't focused on Lois or Clark so it was a nice distraction. By the way at Jon's age he's home alone despite his almost setting the farm on fire in a cooking mishap last week and expected to put himself to bed by 10pm? I think Man and Pa Kent would not be very happy with the parenting skills! Art - 3: Fiumara's art certainly suited the dark stylistics of the issue. It most definitely bring forth the darker elements of the story and brought the peril to noticeably high levels. There was a Stranger Things vibe to the whole issue but I think thats more to do with Fiumara than the story itself. 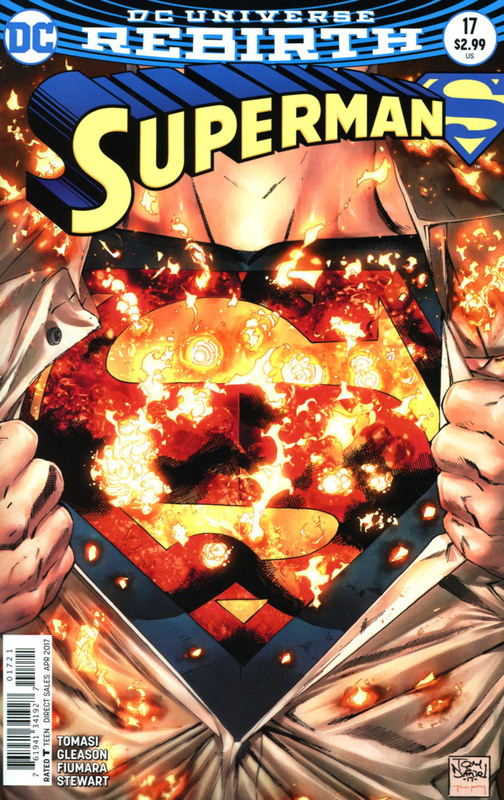 I'm not sure how well the art would suit Superman in general, this feels more Constantine's territory but as I said in this particular issue it made the read through worth it. Cover Art - 5: I really like this spooky montage it really sets the tone for the interior. Jon looks very sweet and innocent as does a nervous Kathy. I like the atmospheric feel. Variant Cover Art - 4: Not entirely sure what the sparks are, gunfire? Still nothing beats the classic shirt rip!